I imagine Williams would argue this is letting the spoilerphobes win, but I don’t subscribe to the rhetorical framing that makes spoiler culture out to be a threat against the way we write about television (and yes, The Jinx is still television). Indeed, I would argue that this trend toward “reality spoilers” as I call them is less spoiler culture at its most absurd, and more a reminder that spoiler culture is tied to the increased agency audiences have and expect over the content they consume; the fact that this would extend to non-fiction narratives is not absurd in the least, even if the end result certainly underlines the incompatibility of this psychology and social media connectivity. “Reality Spoilers” is a term that I used at least somewhat facetiously during the run of WBEZ Chicago’s Serial—I had purposefully chosen not to do any research on the case of Adnan Syed outside of the narrative of the series, and therefore avoided any details that were unearthed by the Reddit investigators scouring the case history for more information. In the case of Serial, I made a decision that I wanted to experience Sarah Koenig’s narrative as a contained perspective, informed by my academic interests in media narratives and the way they are constructed. This was not something I was particularly militant about—although I sent some “#RealitySpoilers” tweets to people I follow on Twitter who went deeper than I would have liked, it was primarily a desire to be able to understand Keonig’s perspective as clearly as possible, without engaging with the fan-created paratexts that result from separate investigations. I felt similarly about The Jinx. Watching the series, I knew there was copious reporting on the stories involved, but I wanted to focus my engagement with the case on the way Jarecki played out the narrative in question, and revealed information to a presumed viewer who knew nothing about the case. Indeed, the subject positioning of both Serial and The Jinx is of someone who knows nothing about these cases—while Koenig does this through using her own relationship with the case as an anchor point, Jarecki comparatively obscures his relationship to the case, jumping through timelines and constructing a non-linear journey through the many lives and deaths of Robert Durst. 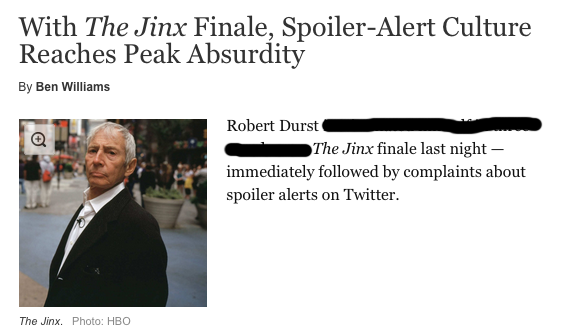 And so when news broke of Durst’s arrest on Saturday, I chose not to read the stories, even though I knew instinctively that the details of the arrest would likely play no part in the final episode of the series. Perhaps defensively, I don’t think either of these perspectives are absurd. The absurdity of spoiler culture lies not in the fact that people want to preserve their experience of watching a given show in the way they desire, but rather in the fact that those people are on social media despite having not watched—or listened to—the most recent episode of the series in question. The absurdity is in the rigidity of some people’s interpretation of spoiler culture, in which they have expectations that everyone will have the same definition of a spoiler. However, in this case, I would argue that the timing and level of detail in New York Times‘ broadcasting of their reporting violated a very generalized—rather than hyper-sensitive—definition of a spoiler, in ways that were logically objected to even if those objections are outweighed by the news-reporting function of the publication. The people who felt spoiled by The New York Times or Vulture or Buzzfeed weren’t being absurd; they were being human, conditioned to a narrative by serialized storytelling, and reacting in ways that spoke to the transformative potential of true-crime documentary filmmaking (or podcasting). Williams is right that any extended grievance over this particular spoiler would be absurd: the series was news-worthy, and therefore has logically and necessarily extended into spaces of popular conversation in ways that would theoretically “spoil” the ending to those who haven’t seen the series or who haven’t watched last night’s episode. However, the initial reactions were logical, not absurd, and came in response to a form of direct—in the case of the New York Times alert—and widespread reporting that did not exist previously, and which had not been integrated into or calibrated within individual viewers’ agency over how they were consuming the narrative in question. And while that remains the purview of the individual to manage as opposed to publications whose goals lie in other areas, and therefore I don’t necessarily feel that those publications were “wrong” for weighing their other mandates over the limited audience for a documentary series, that individuals would be frustrated or upset by this only demonstrates the basic subjectivities—not absurdities—of spoiler culture.